If you look at the Musselman results sheet from both 2011 and 2012 you will see that I was 7 seconds faster this year. 7 seconds does not qualify as a whopping improvement, however as they old saying goes you can’t judge a book by its cover. I will start out by saying that in both 2011 and this year, 2012 I was an am extremely happy with my performance. In 2011 I had a breakout race for where my fitness was. I won the double mussel crown by taking 2nd in the Mini-Mussel and 4th in the half ironman. It was at the time my fastest half-iron race and by far my best run (1:27). The take home last year was that I was improving, I could now start really racing and challenging for the overall podiums. So when I went 4:32 last year it was the best I could do and I went to bed a happy man. Well after posting another 4:32 this year I still went to bed a very happy man last night. (A Dave Matthews concert at CMAC might have helped out with that 🙂 but will keep to triathlon here for now) Like I said I was very pleased with my 4:32. With that said here is how the race played out yesterday. With the temperatures in the 80’s and 90’s for most of the summer, our little lakes have become quite warm. Warm enough to make the swim a “non-wetsuit legal” race. Meaning that if you wanted to compete for the overall win you must swim WITHOUT a wetsuit. This race format does not play to my favor as swimming is definitely my weakest leg. Wetsuits give you added buoyancy making it easier to swim in a better position and thus you move through the water with more ease and a lot quick. Most likely it slowed me down somewhere between 2-3 minutes. During the swim I got a bit off course by following a swimmer who was heading towards a buoy which we both thought was the first turn. Well it tuned out that the buoy we were heading towards was the second buoy, not the first. Once we realized this we high tailed it back to the main group expending a bit more energy that I would have liked. Once back in the group I stayed in a pack for the rest of the swim and came out in 32 minutes. 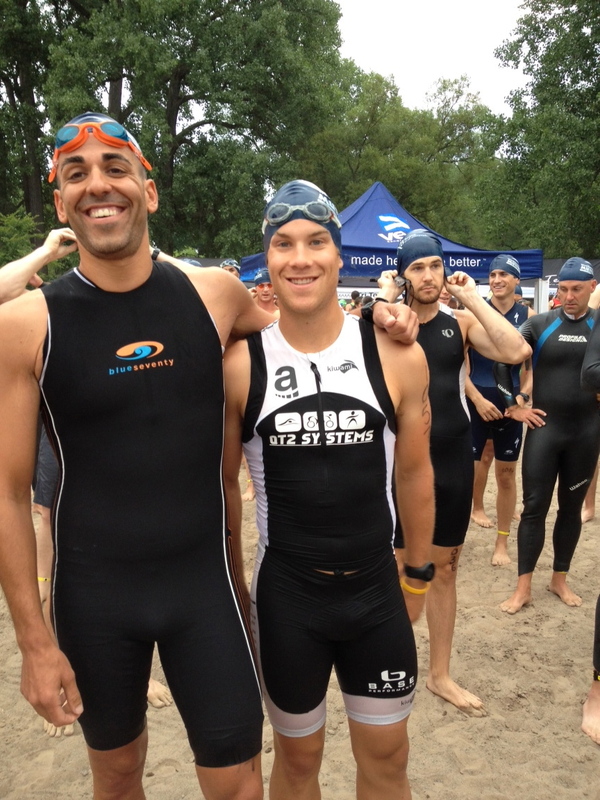 I went through transition with ease as a wetsuit did not need to be stripped. Once the bike was gathered and my helmet strapped I hopped on and got down to business. Having swum a 32 I knew that I would have some catching up to do. I started out aggressive with my effort level higher than it ever has been for a half iron. I kept pushing pretty hard and my body was responding well. The HR and Power readings made sense and I just went for it. By mile 20ish I caught up with my roommates for the weekend (Pat Wheeler and Mike Corona). These guys are the dudes I would typically ride near, meaning we would be at about the same pace. I hung with them for around a minute but I just I had a few more gears. My plan coming into the race was to go as hard as I could on the bike and hang on as best I could for the run. This was a race where I did not want a specific plan, I just wanted to see what my body was capable of and where my limits were. So I made the decision to keep pressing on. I didn’t exactly drop them cold but I pulled away a little bit and probably managed a gap of between 1:30 – 2 minutes. Correct me if I am way off guys. All was good through mile 50. My avg speed was about 24 mph and I was through Sampson State Park (The old Army Depot) which had the worst roads and where it was raining the hardest. So for all intents and purposes the hard part of the bike was done. All I had to do was go straight on a flat road back to the waterfront, just 5 miles. Then disaster struck. I flatted my rear tubular disc. Now I will say that I was due for a flat as I have had a lot of races in a row without one so it was just my time. I’m not sad, bitter or mad…this stuff happens and I am glad that I at least got to mile 50 before it happened. When I realized my tire was flat I was running in 3rd or 4th place overall if you take away the time differences from the wave start. 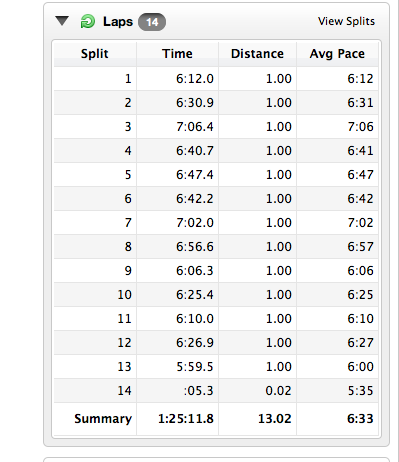 At the pace I was going and figuring I could maintain that for 5 more miles I was looking at a 2:20 – 2:22 bike split. Which would have put me in good position to challenge for 3rd or 4th overall with the run I ended up having. This is all “hypothetical” though since it took me a bit longer to get to T2. After hitting my tire with “fix a flat” I peddled with feet of fury. Then 5 minutes later it went completely flat again. The only saving grace is that since it was a tubular I could very slowly and carefully ride my bike in. I ended up covering the final 3 miles in over 13 minutes. I made it back to transition and after taking a few extra seconds to gather myself and get my head in the game I headed out on the run. I went a bit faster than I intended on for the first mile and then backed off a bit into a more steady pace for the first half of the run. Once I crested the climb up barracks road which dumps you out on pre-emption I made the right hand turn and started really getting to work. The back half of the run course has a lot of downhill sections so I tried my best to go as fast as possible down them. After navigation the descents I returned to the lakeshore for the final 2 miles. I closed with a 6 minute mile and ended up with a 1:25 run which got back in the top 10 overall. Good Job in the face of adversity, take away that flat and you woulda beaten your time. What kinda mileage you putting in a week running to pull some of the times your getting? Thanks. Wouldn’t call it to much adversity, just a little twist 🙂 Weekly mileage is around 40-45 at the moment. I would say 30-40 on an annual basis would be about what it is. The builds come when the big races approach.